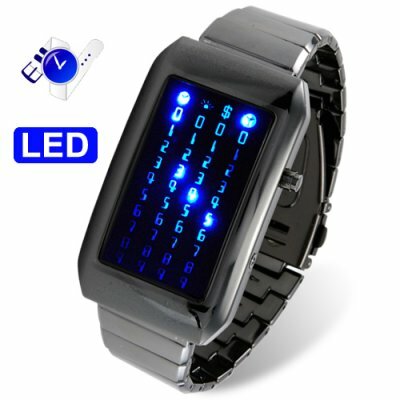 Successfully Added The Warp Core - Japanese Style Blue LED Watch to your Shopping Cart. Introducing The Warp Core, a sub zero blue LED watch from the year 3012 AD, which elucidates solid state cool by re-envisioning how temporal data (time) should be displayed. You mean this watch really tells the time? Yes. Even though The Warp Core diffuses leadership style and Roddenberrian design with its reactive blue LEDs encased in dark Adamantium hues (like Species 8472 defeating The Borg! ), this Japanese LED watch does in fact tell the time and does so really efficiently too! Tap the display button on the right side of the timepiece and watch the screen light up. There are four columns of lights. The first two columns represent hours. The last two represent minutes. You decide when you want the time shown. How's that for fluidic space time travel terrificness? In fact, when you start wearing this watch you may find yourself able to see the entire electromagnetic spectrum and think with extreme logic. Of course you needn't be a Klingon or a Dementor to wear this watch. In reality, this watch is perfect for magically-inclined Muggles, weather controlling orphan thieves, Narnians, fans of Maurice Sendak's "Where The Wild Things Are", or anybody who is a somebody. Just google "Japanese LED Watch" to see how much similar timepieces sell for online. Notice how they normally retail for close to 10x the price we're selling them for. Even if you don't intend on buying one for yourself, stock your online store with these head-turning watches to lock in some amazing profits! Brought to you by the leader in direct from China wholesale electronics - Chinavasion. Similar LED watches sell on the Internet for over 10x the Chinavasion price, simply google "Japanese LED Watch" to see for yourself. How do I change the time, date, day of the week on this watch? This Japanese inspired LED watch uses two CR2032 watch batteries. Other names this type of battery goes by are button cell, silver button cell, or coin cell batteries. Why is this watch called The Warp Core? Warp Core refers to the main energy reactor which powers warp-capable starships...you might want to start watching a somewhat obscure TV show called Star Trek to learn more about warp cores. You mentioned that this watch is perfect for magically-inclined Muggles, weather controlling orphan thiefs, Narnians, and fans of Maurice Sendak's "Where The Wild Things Are". What if I don't belong to one of these groups? This watch is also perfect for fans of the Marvel comic series Cloak and Dagger, professional Poker players, supermodels, Gary Numan fans, ventriloquists, GOA trancers, and anyone who still gets on their shopping cart and races it down the supermarket aisles. The cool b lue LED lights make reading the time and date easy. It's sturdy metal construction could put up to most everyday abuse.Other than that, the watch is a perfect gift to any geek and a very good time telling tool for me. light weight, yet you still know it's there. the rounded design of the band is definitely a plus- i don't feel the edge of the band hitting and scratching my desk or laptop. I absolutely love the effects- including the flashing it does on each hour. the setting of the watch was relatively simple, as long as i read through the directions entirely instead of "glancing and setting." the larger face does mean most petite women may not care for the size.